There are many layout options when designing a pool. With the many options of size and shape, consider a geometric shaped pool as the right selection for your backyard. Sleek lines, angles, and curves make the geometric design offer versatility of both function and aesthetics. Though the lines may look basic, a geometric pool can offer a modern feel to your backyard. 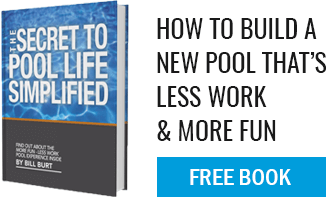 Be sure to extend the modern look to all elements of the pool. Like the pool shown below, we recommend carrying the geometric design into the steps, spas, benches and/or sun shelves to keep the look coherent. If you have a steep backyard with retaining walls, continue that multi-level look in your pool design. Adding elevation changes to geometric pools is also a great way showcase materials or design features. With a mosaic tile design, a waterfall, or LED lighting on an elevated wall you can add a show stopping piece to your backyard. Some geometric pools are designed for practical benefits as well as aesthetic benefits. An L shaped geometric pool can offer both beauty and practicality. The L design allows for a shallow entry or play area, and a long side for swimming laps. You may also choose a deep area on the long side for a diving pool option. Whatever Geometric designs whether Grecian with curves or modern with sleek lines, we can help you find the best fit for your backyard. There are many combinations of curves, angles, and lines that we can create to give your pool the best look and feel for the space you have, and for the type of use you want to get out of your pool.